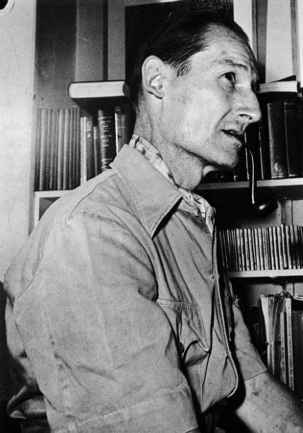 The two general approaches, regression-based and hypothesis testing-based methods, to quantify adverse effects were established early in the history of ecotoxicology. Most regression-based methods are intended to predict the intensity of effect associated with exposure to a toxicant concentration for a specified duration although regression models incorporating exposure concentration and duration simultaneously are becoming increasingly more common. Hypothesis testing-based methods were originally designed to generate some measure of effect in situations in which a regression model cannot be fit with sufficient goodness of fit. However, they have gradually become the effect metrics of choice for chronic exposures that commonly, but not always, produce data less amenable to regression modeling than do acute exposure studies. Regression-based metrics of effect are generated with well-established test designs. The most widely applied design includes a series of exposure concentrations or doses. There are tests, notably effluent toxicity tests, with slightly different treatments. In the case of an effluent test, the effluent is mixed with different amounts of clean water to generate a series of effluent dilutions. The diluent water is either taken from the receiving water or standard synthetic water is used. The treatment intensity is expressed as (effluent volume)/(effluent volume + dilution water volume) x 100%. Regardless, subsets of test individuals are either exposed to constant levels of toxicant in their surrounding media or food, or given a specific dose of toxicant, perhaps by injection, topical application, or gavage. In the case of a lethal effect, the number of individuals affected at each concentration or dose treatment is tallied after a specified duration (Figure 1). The data pairs (concentration, dose, or dilution vs. intensity of effect) generated for the series of concentration, dose, or dilution treatments are then fit to one of several candidate models using conventional regression methods. Most of the commonly applied models are sig-moid functions that accommodate lowest and highest possible limits for effect intensity (Figure 1). For lethal effects, the lowest level might be zero or some baseline level of natural ('spontaneous') mortality, and the upper limit of effect is often 100% mortality for the exposed group of individuals. Figure 2 The probits of the predicted and observed proportions vs. the natural log of the effluent dilution, and the predicted 95% confidence intervals for the data from Table 1. The LC50 is estimated by exponentiating the x values corresponding to the probit for 50% mortality. Figure 1 (a) A typical experimental design used to generate regression-based metrics of effect and (b) the associated sigmoid dose-response curve . The organisms that died in response to the treatment are denoted in black and those still living are denoted in white. where p = the probability of or proportion of exposed individuals dying, S = the probability of or proportion of unexposed individuals dying, $ = normal cumulative function, a = an estimated regression intercept, and b = estimated regression parameter accounting for the influence of ln dose on p. Spontaneous mortality may be included in the model because laboratory culturing conditions are such that some unavoidable mortality occurs or because the longevity of the organism is short relative to the length of the test, natural mortality is to be expected during the test. In either case, the assumption is made that the spontaneous mortality does not influence the relationship between dose/concentration and associated mortality. This may not be an acceptable assumption in some cases. lethal dose (LD50) and median lethal concentration (LC50) predicted after a specified duration of exposure are currently the primary metrics of acute lethal effects. For nonlethal effects fit by regression to concentration- or dose-effect models, the median effective dose (ED50) or concentration (EC50) are predicted instead. Despite this convention of predicting median effect levels, a trend has begun that draws the focus of effect assessments more and more often toward lower levels of mortality or effect, that is, LDx or LCx where x < 50. We anticipate that this trend will continue, resulting in some changes to the methods described below for predicting LDx and LCx values and their confidence limits. As the emphasis in ecotoxicology shifts downward on the dose/concentration-response curve, more attention will be required in selection of the best among the candidate sigmoid models. Effect metrics are similar for the models at the center of the curve but predictions from the most commonly applied models (e.g., probit, logit, or Weibull) diverge as one makes predictions toward the tails of the distributions. Figure 3 Methods for predicting LD50 or LC50 values using data from dose or concentration-effect experimental designs. X2 statistic. The advantage of these models is the ease with which estimates and associated confidence intervals can be generated for different p values. A nonparametric approach can be applied instead if the data set does not fit any model acceptably or if the iterative MLE method fails to converge on an acceptable solution. 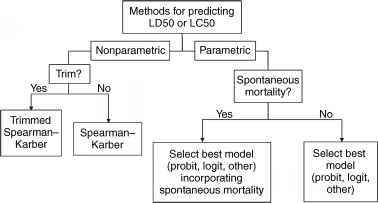 The Spearman-Karber technique with or without trimming of data from the distribution tails is the most commonly applied technique in such a case to generate a LD50 or LC50 estimate and the associated 95% confidence limits. Data from a mysid shrimp experiment can be used to illustrate the regression method for predicting an LC50 value. Juvenile mysid shrimp were randomly assigned to a series of diluted refinery effluent solutions with ten shrimps per tank. There were seven treatments including a control with duplicate tanks per treatment. Concentrations were expressed as the percentages of total exposure volume made up of the effluent. The mortalities were checked after 48 h of exposure (Table 1). These data were fit to candidate models of log normal ('probit') and log logistic ('logit') by an interative maximum likelihood estimation. The associated Pearson %2 statistics (X2 = 4.81 for log normal, %2 = 5.01 for log logistic) indicated that the log normal model provided a better fit than the log logistic. Figure 2 shows the probits of the predicted and observed proportions dying at 48 h (expressed in probit units) versus the natural log of effluent dilution, and the predicted 95% confidence intervals. (The observed data for the 0% and 100% mortalities were not shown because they do not have corresponding probit values.) Thus the LC50 and the associated lower and upper 95% confidence intervals can be estimated by exponentiating the x values corresponding to the probit of 50% mortality (5), which are 21.9%, 18.4%, and 25.8%, respectively. Modified from table 2 of Buikema AL, Niederlehner BR, and Cairns J (1982) Biological monitoring, Part IV-toxicity testing. Water Research 16: 239-262.
determine the relative toxicities of a series of poisons or to assess how different factors influence the toxicity of a single poison or drug. In such applications, the exposure durations would be set for convenience, for example, acute toxicity after 96 h of exposure because a 96 h test fits conveniently in a workweek, and still generates a meaningful metric of toxicity. So, a p of 0.5 and 96 h test duration might be used for statistical and logistical convenience, not because they reflect pivotal values relative to an acceptable or unacceptable effect to humans. These regression-derived effect metrics were borrowed by ecotoxicologists who then attempted to apply them to making decisions about the concentration or amount of a chemical that should be a concern if present in an environmental media. Given the multiple levels of biological organization that an ecotoxicologist must consider in such a decision, it should be no surprise that these effect metrics do not provide all of the information needed to make an informed decision. Often the duration selected for LDx or LCx estimation is different from that of interest; so extrapolation is required to predict the p associated with an exposure duration other than that used in the test. Such extrapolation can generate unacceptable, or minimally, undefined uncertainties in predictions. The associated uncertainty can be reduced by noting the proportions responding in a series of durations during the test and estimating several LDx/LCx for these different durations or by applying survival time regression models instead. Another shortcoming of these effect metrics is that mortality occurring during the period following exposure is rarely measured. Some toxicant exposures produce considerable post-exposure mortality that is important to consider when making predictions of effects to populations exposed in the environment to the chemical of interest. A third shortcoming is not as much one of the regression-related metrics but rather of the decision-making process using these metrics. Often the responsible risk assessors or decision makers lack the expertise or information to determine what level of predicted effect (p) should be used as a cutoff for unacceptable adverse effect to exposed individuals, populations, or ecological communities. This can make the regression-related metrics less appealing to assessors and managers than the hypothesis test-based methods described in the following section.